For the fifth year in a row, Fall Protection (in construction) tops the list of most frequently cited OSHA Standards. 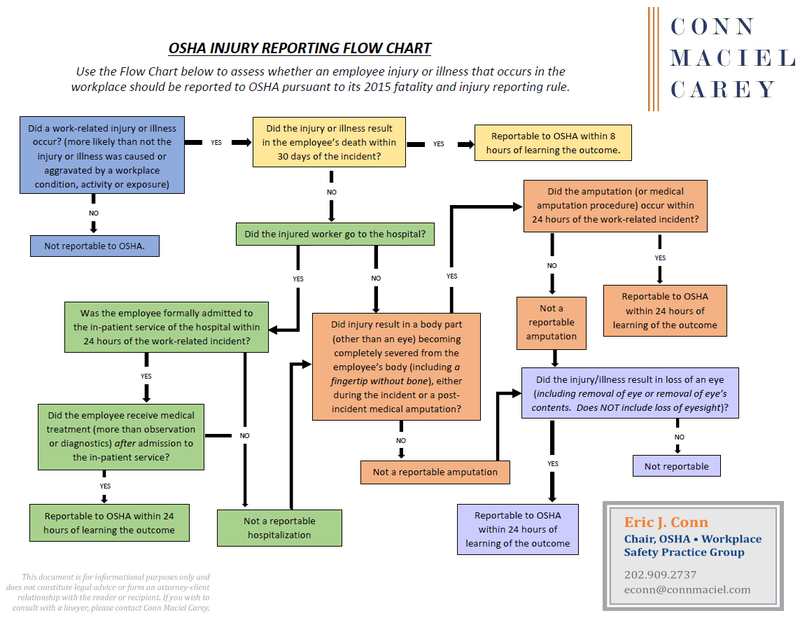 Because of the trend, in 2014, OSHA began an annual campaign for a “National Fall Safety Stand-Down”. The Stand-Down entails employers and workers voluntarily stopping work and discussion fall hazards and fall protection via training presentations, toolbox talks or other means. More than 5,000 employers took part in the 2014 Stand-Down, impacting more than a million workers across the country. 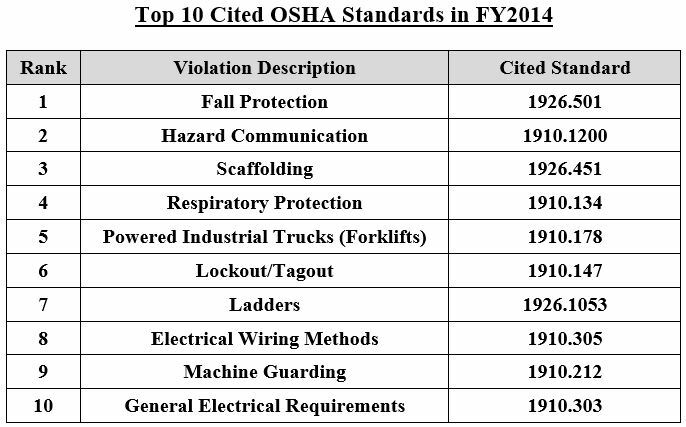 Like the familiar view of Fall Protection at the top of the list, the overall top 10 list in general fits a common pattern from the past several years, with these same standards filling out the top 10, with only some slight variation in the order in which they appear on the list. Specifically, only Lockout/Tagout has moved up higher on the list from its previous standing. This increase is likely attributable to the Amputations National Emphasis Program to which OSHA has dedicated significant enforcement resources over the past two years. Most notable on the list, however, is OSHA’s Hazard Communication standard, featured prominently as the second most frequently cited standard in FY15. 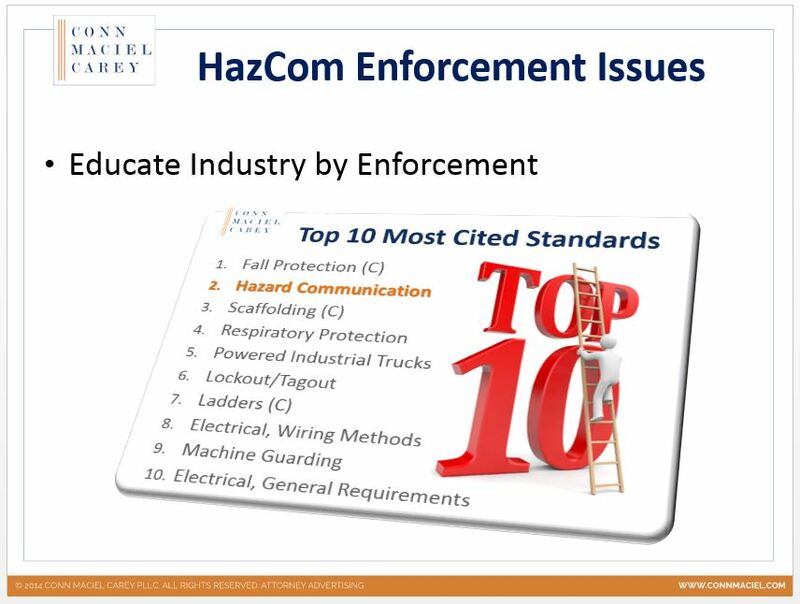 Hazard Communication is always high on this list, but with OSHA nearing the end of the rollout of the new GHS Hazard Communication standard, and all of the major compliance obligations (e.g., new labeling requirements, new form Safety Data Sheets, updated written programs and training) all already due or due within the next year, we can expect a real focus by OSHA on HazCom compliance; i.e., OSHA will educate industry about the new standard by a heavy dose of enforcement.